A.I. for the 2nd time with English/English. How David can reach to "Blue Fairy" ? Good for such snowy day like today to stay home and watch this kind of fantasic movie and learn English wordings or so. [ Outside ] - Very much rare enough, but we've just got an Weather Alert of heavy snow 'storm' kind. Alas, trains stop many where at their operations due to weather. Look at the pic ! 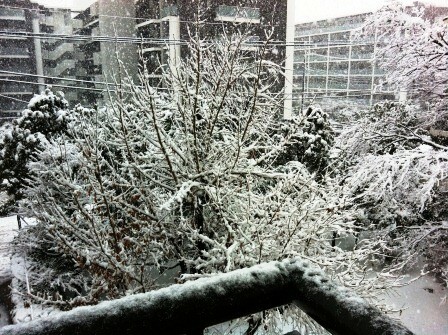 Still keep on snowing and stick to the ground more & more…likewise A. I. 's background after global warming. Though Greater TOKYO skies occasionally sprinkle snow in January/February, rarely does it stick to the ground. 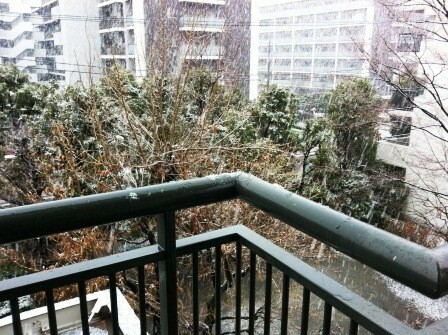 But today, it has already started to stick to heavily. Wow ! This could be happening and amazing. True story is. - Lost 11 years life in Japan / Gain 11 years instead in the U. S. A. Even more than 12 years passed since then, my daughter got a heart warming letter from her mate in Sunnyvale, so do I. ( found a colleague at FB ). ◆Movie A.I." Artificial Intelligence " by Steven Spielberg directed. Amazing story, pursuing LOVE and MEMORY of human being and adventurous enough as old fairly tail and even scientific fiction. OMG ! Another interesting point was that title back shows some of "Licensed" by University of Hebrew in Jerusalem. This might be because Stanley Kubrick has some relationship with them or so ?